If you would like Registration Forms for 2017-2018 school year, click the links below. Registration Forms **St. Mary's is accepting registration for grades PreK through eighth. *This is for release of records, it is required of any family wishing their records transferred to another school. *Physical exams are required for all students entering preschool, kindergarten, sixth grade, students who are new to Illinois or participating in sports. ****Beginning Fall of 2013, all students entering, transferring, or advancing into 6th, 7th, 8th, 9th, 10th, 11th or 12th grades will be required to show proof of receipt of one dose of Tdap vaccine (containing tetanus, diphtheria, acellular pertussis). Most students may have already received the vaccine and simply need to provide the school with verifying documentation from the family health care provider. *Eye exams are required for all students entering kindergarten or are new to Illinois. *Dental exams are required for all students entering kindergarten, second and sixth grades, and all students new to Illinois. 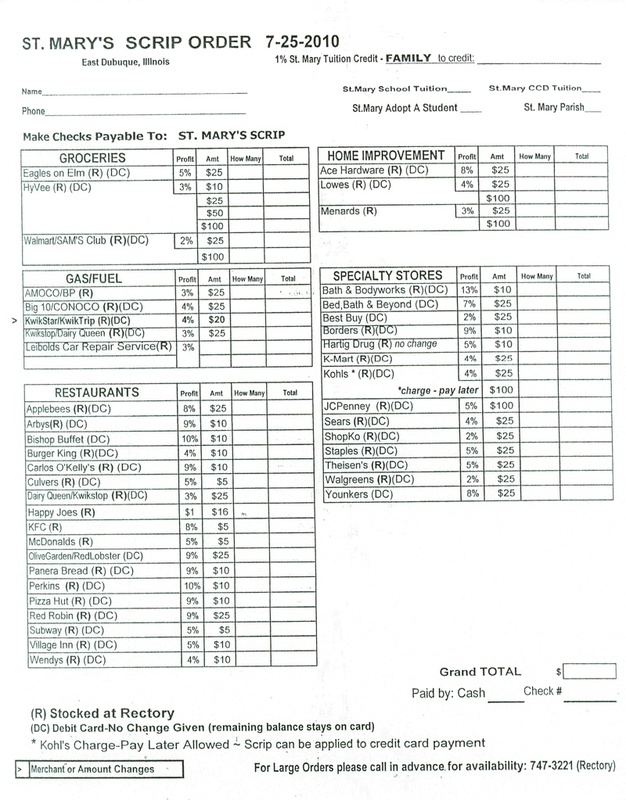 * Use this form to order SCRIP certificates, and receive a credit towards your child's tuition. * Free summer meals are offered to all families. Please see flyer above. Remember, all school volunteers must have completed the Protecting God's Children Online Program and a Background Check.